Today we almost had a hurricane. Isabel roared up the sound and did amazing damage to the Outer Banks of North Carolina. It’s headed north to Baltimore and New York and Boston. Here, in Raleigh we had a bit of rain and lashing winds but nothing as bad as we had expected. I wore my rain boots, anyway, and my trusty denim shirt-dress. This necklace features a pocket watch locket fitted with a round mirror and a triple strand of kimono cording and silk accented with ceramic Elaine Ray beads. That green in the locket is out wet garden reflected in the mirror. There will be instructions appearing on my other blog very soon. This necklace features a watch-locket and textured strands emerging from a pair of cast cones. 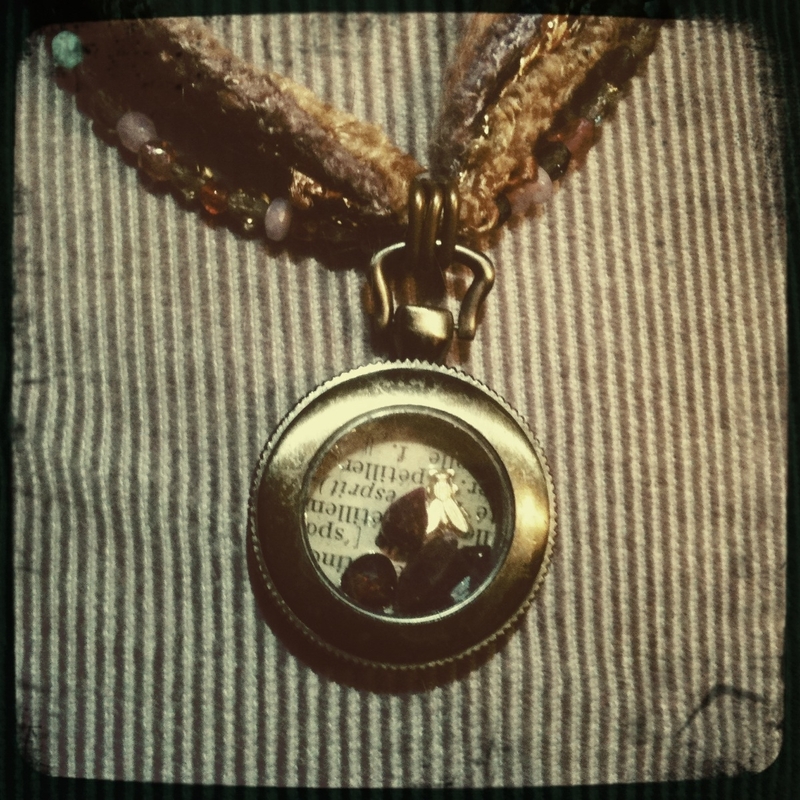 I made the locket with a bit of text from a dictionary, a tiny bee charm and four stones. The stones are lovely briolette garnets that I could not string because of cracked holes. They glisten nicely in the locket. 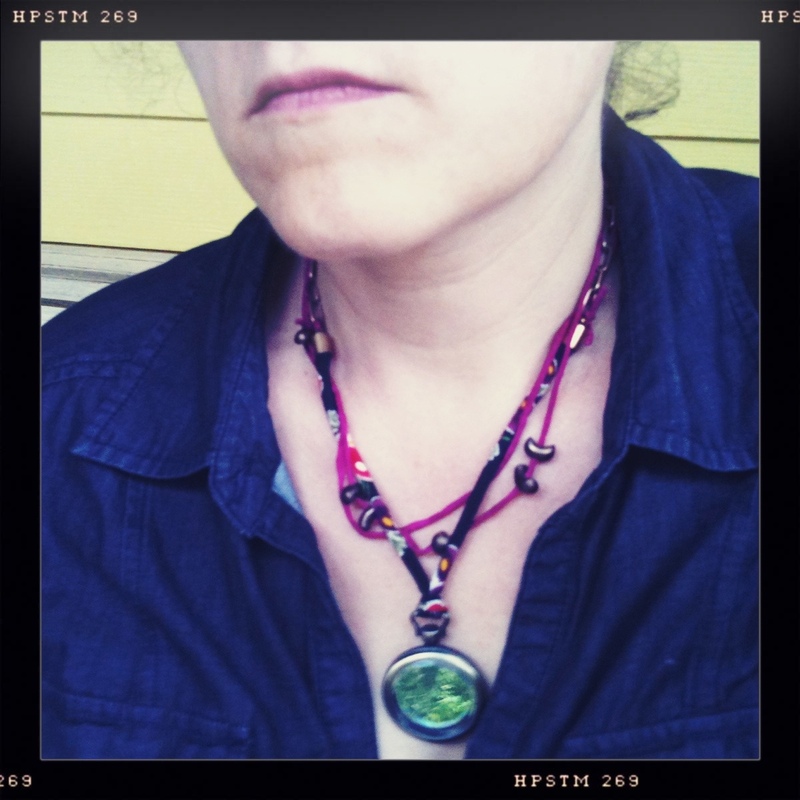 The necklace itself was made by Tracey Johnson. We needed a piece to send in to a magazine…they wanted fibers, fall colors, a pendant. Somehow the two of us came up with this piece of jewelry. Note: sorry for the delay on posts the last few days. I have had trouble getting my photos to upload from my phone. I’m trying to do this blog in the most expedient (read: low tech) way possible and my plans did not include sitting down at my laptop each night. 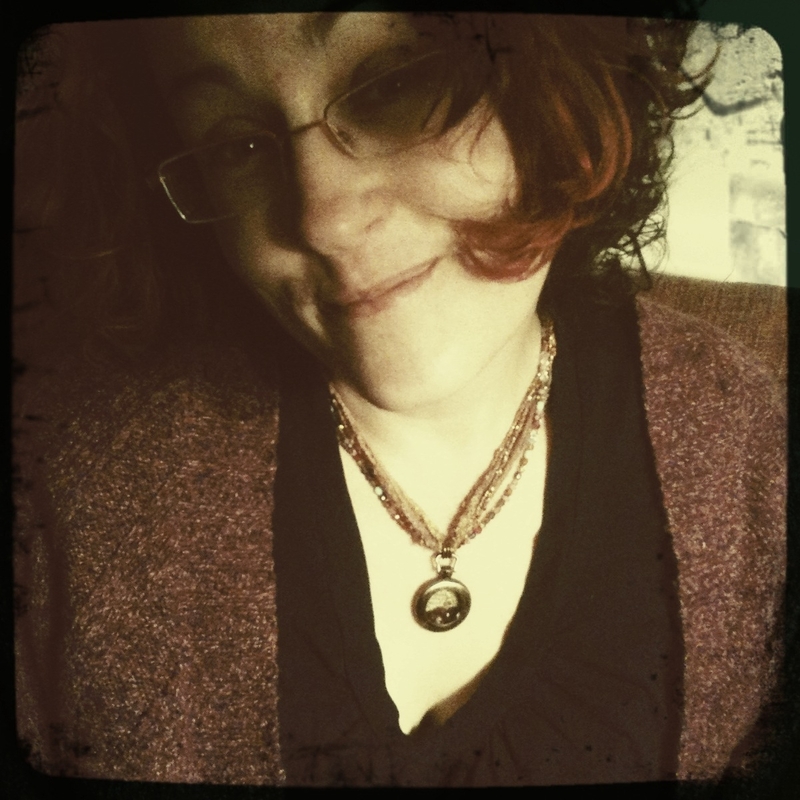 I still am wearing a different necklace every day, even if I can’t get it to post on the correct day.